now became the capital of information securitybusiness continuity technology infrastructure. 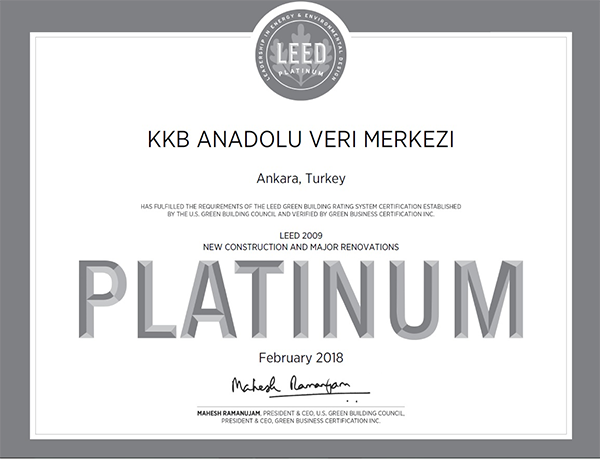 This Infrastructure, which will lead technology usage in Turkey to the next level, built in Ankara, as Kredi Kayıt Bürosu makes a pioneering achievement. Designed and built with latest technologies specifically as a data center, The KKB Anadolu Data Center in Ankara is ready for all sectors. Located in a 43,000-m2 (463,000 ft-sqr) campus, KKB Anadolu Data Center is owned by Kredi Kayıt Bürosu A.Ş. Anadolu Data Center consists of 3 major sections. Aside from being an eco-friendly LEED-Gold standards designed the data center, it is also a digital castle with technical, environmental and physical security measures at the highest level. 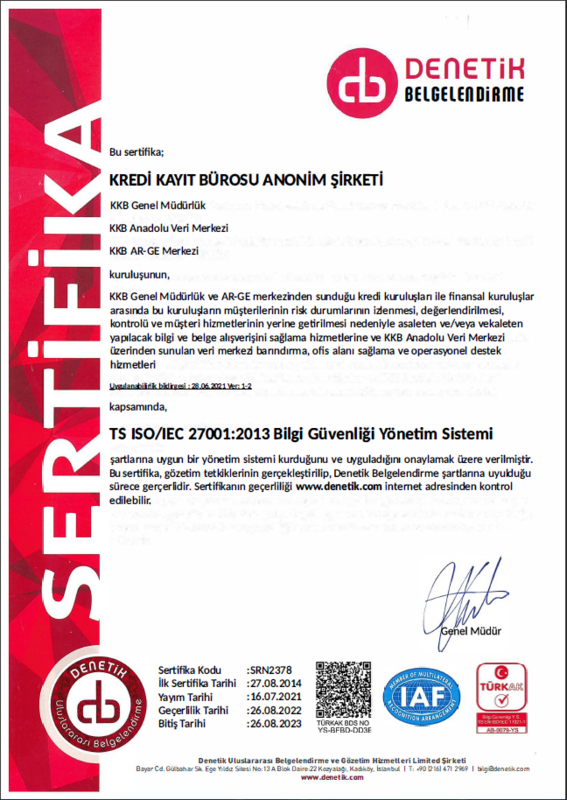 Multiple Network and Internet Service Providers offer network connections through alternate fiber routes connected to the KKB Anadolu Data Center. KKB Anadolu Data Center is located in Ankara. The building has been custom designed and constructed to serve exclusively as a data center. It is protected against possible lightning strikes. Although it is located in a low risk earthquake zone, all critical equipments are secured with seismic isolators. Energy and data cables are ready and connected up to the cabinets. Energy and data cables run through separate cable trays, baskets, and terminate in cabinets. No raised floor within white space area. Access to the Systems Control room is controlled by a biometric security system. Front and back cover of each cabinet are protected by digital access control system. The energy infrastructure meets Uptime Institute Tier IV criteria. Power is supplied from two separate transformers, has a minimum capacity of N+1 and is active-active in nature. All power suppliers (grid, UPS, generator) are voltage-equalized and protected against abrupt power changes. 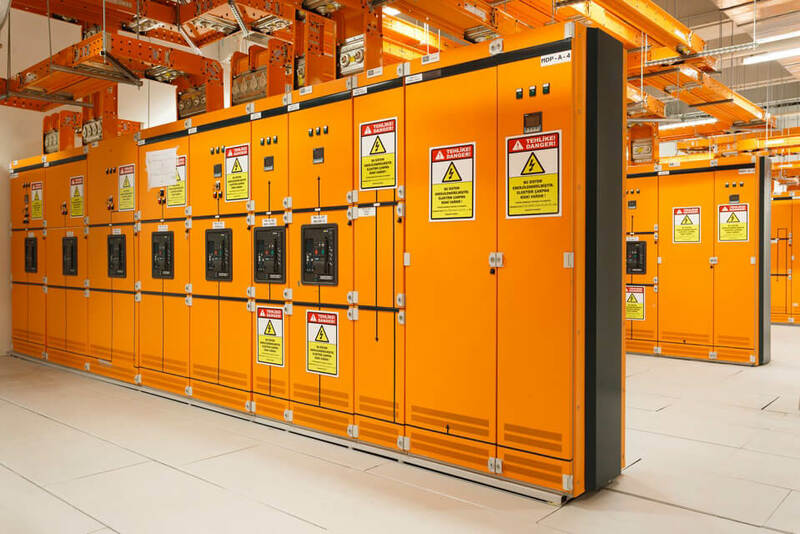 The generators supplying power to the data center have a minimum back-up of N+1. 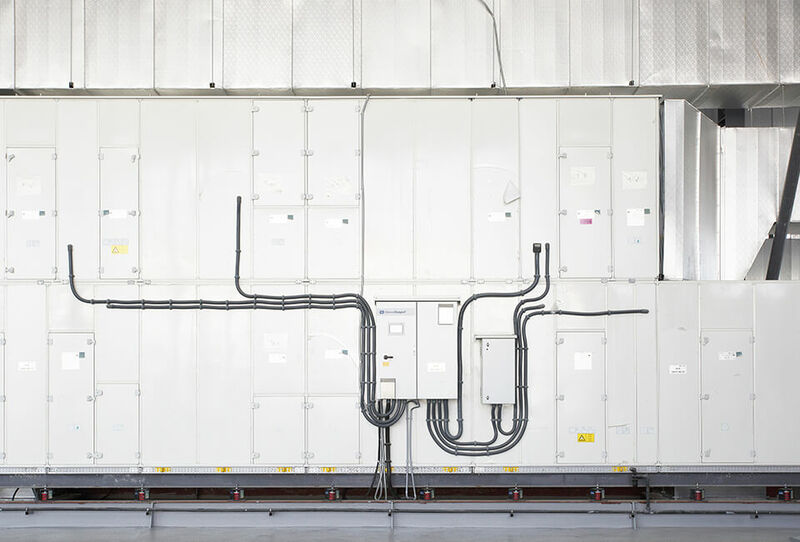 The generator tanks supplying the data center have the capacity to supply the data center for at least 24 hours at standby charge. The generator groups are synchronized among themselves. 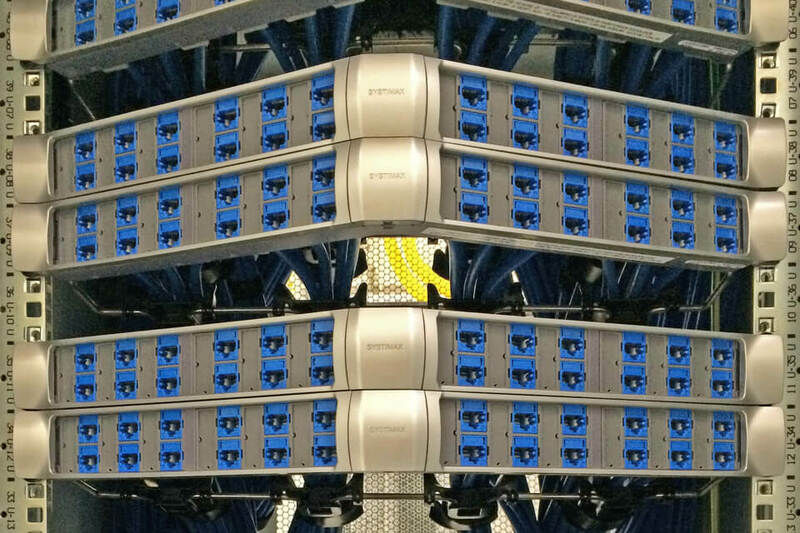 The charges within the data center are supplied by 2 separate UPS groups. The UPS groups have a minimum back-up of N+1 capacity. 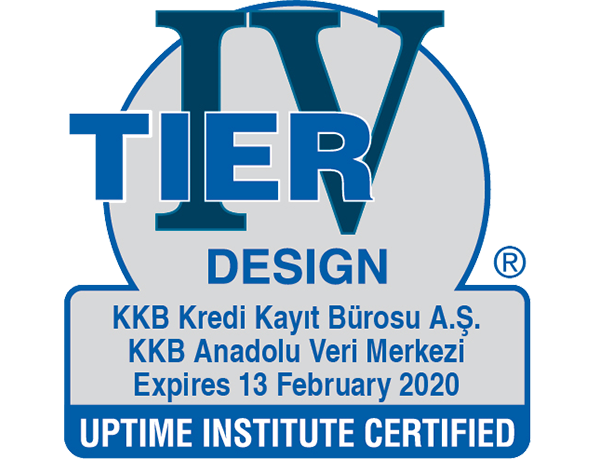 The climatization infrastructure meets Uptime Institute Tier IV criteria. Air Cooling & Conditioning system has N+3 redundancy. Air Cooling & Conditioning System has air-to-air indirect free cooling technology. Hot-air aisle containment approach is used. Inlet temperature will be 24 °C (+/- 5 C). Humidity will be 50% RH (+/-25% RH). Air Cooling & Conditioning system has 7/24 cooling and humidity monitoring & control in case of any breakdown. There is at least 2 PDUs in each cabinet. Each PDU is powered by a separate UPS group. PDUs can be monitored remotely and the power consumption of the entire PDU can be measured. There will be no measurements per socket, but it will be possible to switch on/off each individual socket remotely. Smart PDUs are employed to distribute power to the active devices within the cabinets at the data center. Due to cabinet design, PDUs can be installed at “0” U height and at a vertical angle to the cabinet. Smart PDU 1PH (single phase) has the capacity to draw a current of 32A. Average 4,5kW energy will be provided per cabinet. If necessary, it is possible to supply a 3PH (three-phase) 32A current. All cables and related equipments are manufacturer’s factory tested. The copper cabling can support speeds of 10/100/1000 Mbps and 10 Gbps. The fiber optic cabling is at least OM3 standard and supports speeds of up to 10/40/100 Gbps. All the fiber optic and copper parts (cables and connectors) of structural cabling are supplied by the same manufacturer. Pre-terminated fiber infrastructure based around MPO connectors have Max. Insertion Loss value of 0.35 dB, and Min. Return Loss value of 27 dB. 8 MPOs cassettes can be installed per cabinet. Only authorized visitors and personnel can enter the campus. 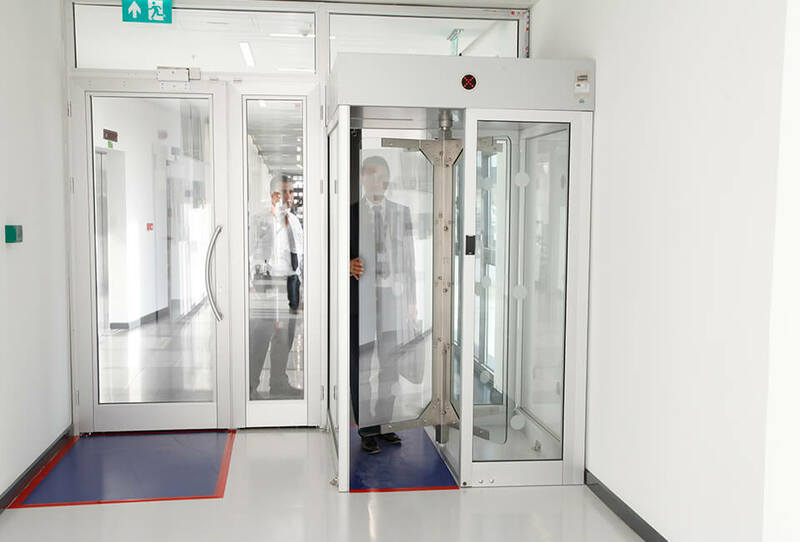 Multiple levels of biometric and classical security checkpoints exist within the data center. Data center building and infrastructure are managed and monitored 7x24 by state-of-the-art latest technology systems. KKB Anadolu Data Center offers hosting services for both Primary Data Centers or Disaster Recovery sites. Centralized Operational Services for the Finance sector and Cloud Services as the largest Domestic Financial Cloud Platform for Turkey are planned. You may bring your own equipment or rent KKB’s installed equipment to offer services to your customers at the KKB Anadolu Data Center. You may choose to operate your own equipment at your designated area assigned only to you, or acquire operational services from KKB. You may bring your own equipment or rent KKB’s installed equipment to back-up your main data center services at a rented area within KKB Anadolu Data Center. If your company is in the finance industry, you may utilize KKB applications and infrastructure centralizing financial operations via the KKB Anadolu Data Center. According to your needs, you may benefit from the applications and services of cloud technologies "which will keep the data within Turkey". You can also use data back-up, media back-up, data security and access security services provided by KKB. 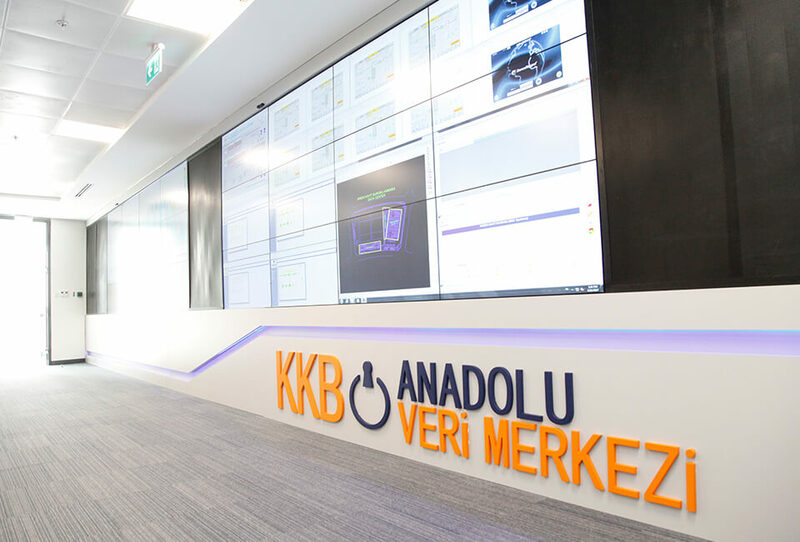 KKB Anadolu Data Center boasts a cutting edge infrastructure, top-level security solutions for all sectors, particularly finance, and a multitude of key certifications. KKB Anadolu Data Center's technical specifications, details about services, products, and the campus. 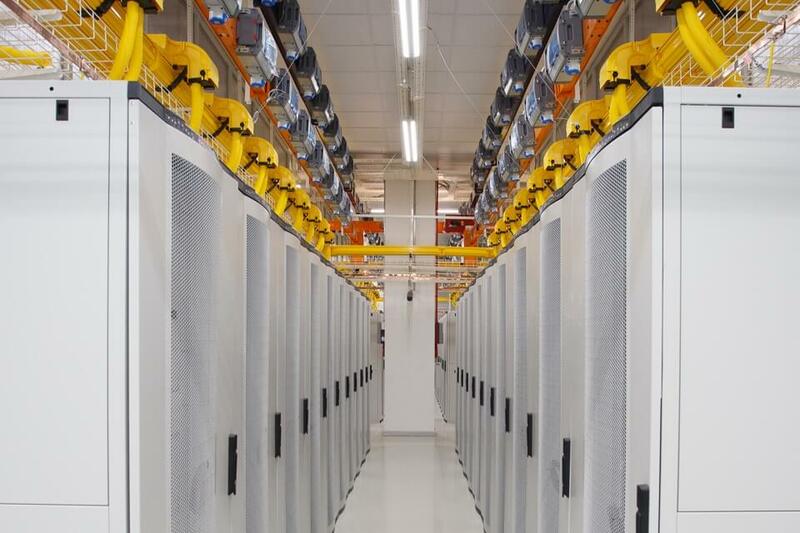 IS THE DATA CENTER'S LOCATION EARTHQUAKE-PROOF? The data center is located in a 4th level seismic region, which represents the lowest risk level, and all ground studies have been completed. IS THE ENVIRONMENTAL RISK ANALYSIS COMPLETE? HOW THE ENVIRONMENTAL SECURITY IS ENSURED? Local and foreign experts carried out extensive analyses using international data center standards, examined the region’s risk history in detail, and assessed all environmental risks. The data center is located in a secure area, which further reduces security risks. WILL THERE BE ENOUGH POWER AND WORK SPACE IN CASE ALL CUSTOMERS ATTEMP TO USE THE DATA CENTER AT THE SAME TIME? Yes. KKB designed and built Anadolu Veri Merkezi data center, which can offer full capacity service to all members at the same time. The data center also has a special power supply scheme to meet full capacity service demand from all members. Meanwhile, its electricity infrastructure has the redundant infrastructure in case of a power outage. 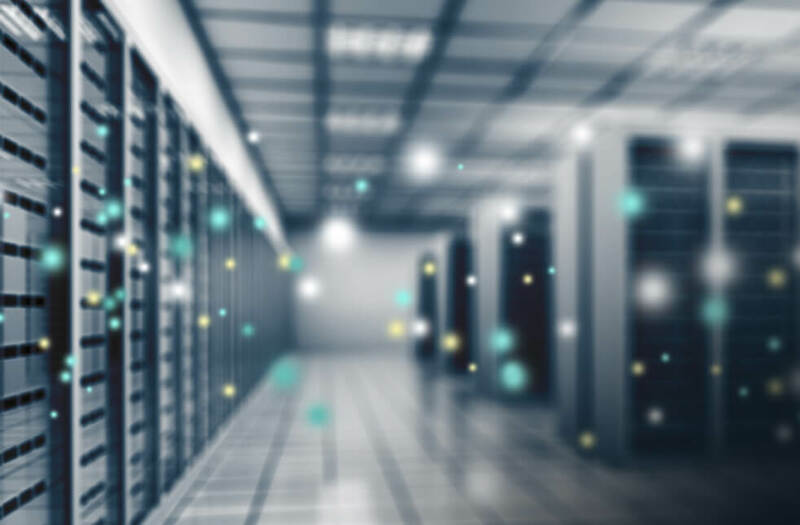 The cooling systems, one of the most important functions within a data center, are designed to work without interruption even in cases of power outages. WHAT ARE THE CABINET SPECS? The 19” data center rack cabinet system has the Turkish Standards Institute (TSE) certificate fulfilling EN 61587-1, IEC 60917, IEC60297 standards. It is also possible to place non-standard cabinets (mainframe, disk units etc.). Please contact the data center management for such demands. HOW ARE THE SYSTEM ROOMS PHYSICALLY SECURED? In the system room, customers will be authorized to access their own areas only. Entrance to the system room is controlled by mantraps with sensors and biometric iris readers. Visitors to the system room will be accompanied during their stay. System room will be monitored by camera, and the cameras are positioned to capture the cold air aisles in front of the cabinets. Access to the front and back covers of the cabinets and the hot aisle entrances will be possible only with personalized cards. A separate system will monitor the opening and closing of the cabinet covers. Camera recordings are kept as defined in regulations. CAMPUS INFRASTRUCTURE: ARE DEVICES SUCH AS GENERATORS AND AIR CONDITIONERS MONITORED? HOW THEIR SERVICE CONTINUITY IS GUARANTEED? Yes, the devices are monitored. The devices have their separate monitoring units, while the BMS (Building Management System) monitors all of them in integral fashion. 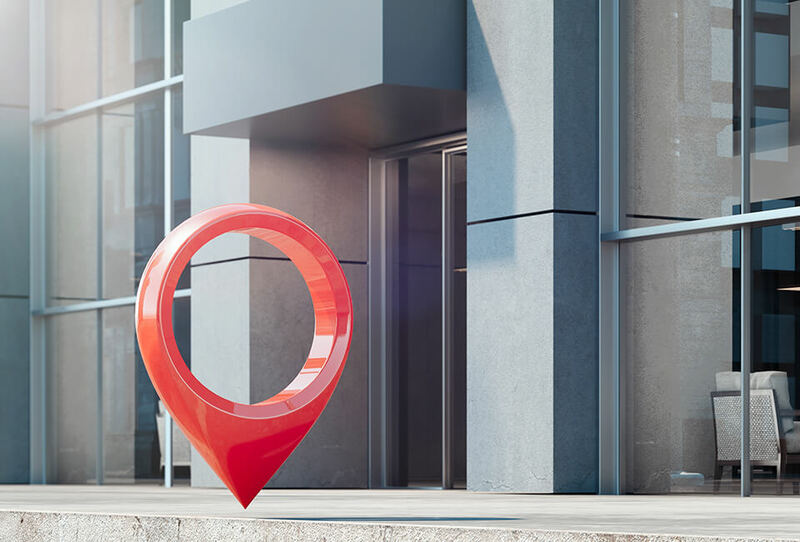 Access Control, fire detection, lighting automation, BMS and other systems are also controlled by a general system called Integrated Building Management System. 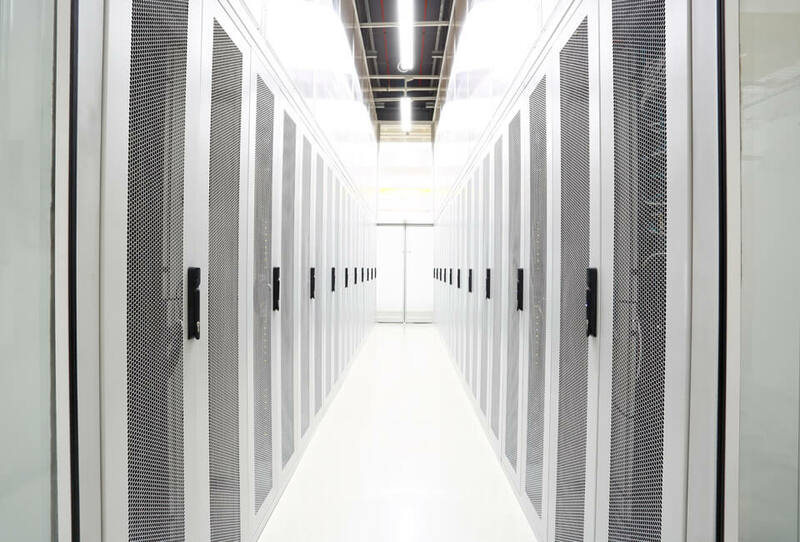 Data Center Infrastructure Management (DCIM) software is employed for monitoring, inventory and business follow-up for the cabinets and sensors within the white area. KKB has rapidly grown since its establishment. Today, KKB offers financial data sharing services to around 200 member institutions including banks, consumer finance companies, leasing, factoring and insurance companies. 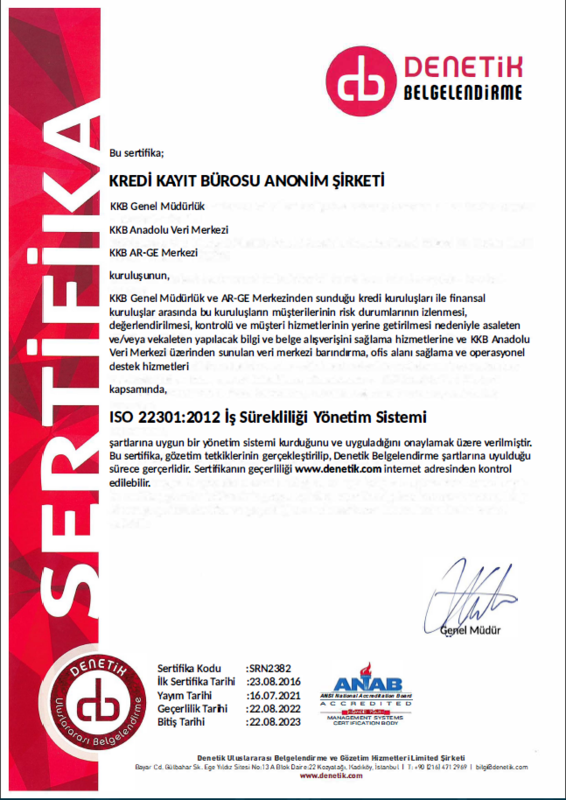 KKB is the sole service provider to the Risk Center of The Banks Association of Turkey. © 2016 KKB Kredi Kayıt Bürosu. All Rights Reserved.